The history of the company starts in 1855. It all began with the fact that there was a waterfall that could be utilized milling grain to flour. The very first buildings for milling are today a museum, and a water-turbin is instead installed to produce environmentally friendly energy. 10.000 litre of fresh water per second can run through the Francis water-turbine, and this provides more than 1.000 kwh of renewable electrical energy to our plant. Vestkorn uses dry mechanical processing without the use of any processing additives or chemical compounds. After thorough cleaning, the peas and beans are dehulled and kernels are separated from the hull. Then the kernels are milled to a very fine powder. By the help of an air centrifuge, this powder is separated in two fractions, one protein rich fraction and one fraction rich on starch. These flours are then packed or further processed to add functional benefits. The hull is milled in a wide range of particle sizes and can also be heat treated. 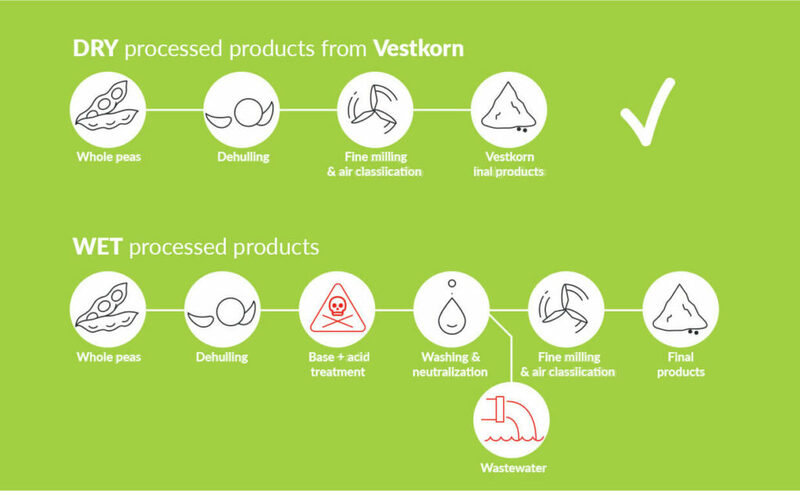 Vestkorn offers on of the purest pea fibres available. During the production processes there are no waste water and all used materials like paper, metal and wood are all recirculated. There are no chemical waste or waste water from the process. Used materials like paper, metal, glass, wood etc are all recirculated to protect the environment. Peas and beans have a high nutritional value and health benefits. Not only are they high in proteins, fibres, starchs, vitamins and minerals. They are also non-allergenic and environmentally sustainable. Legumes like peas and beans are plants that contribute to nitrogen fixation, containing symbiotic bacteria called Rhizobia within nodules in their root systems, producing nitrogen compounds. Nitrogen is a major component of protein and a required nutrient for plants. 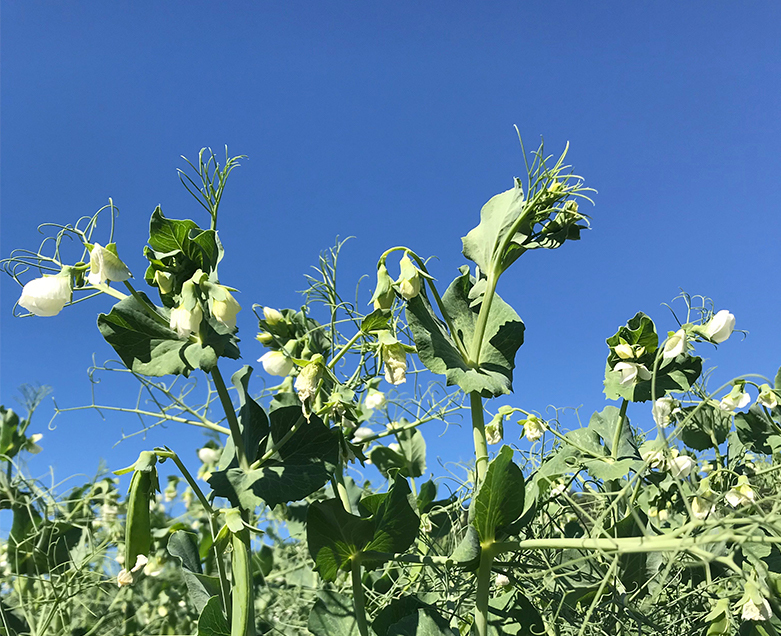 Peas or beans, or other legumes, in the crop rotation usually lead to lower needs for mineral and organic nitrogen fertilisers, which contribute to 25% of the total direct greenhouse gas emissions by agriculture in the EU*. Incorporating legumes like peas and beans into long-term crop rotation systems also provides some positive effects on soil conditions. Soil carbon plays a key role in the carbon cycle, soil fertility and plant development. Thus it is important in global climate models and agricultural systems. Higher yields are observed for crops following peas and beans. Yields of wheat, maize or rapeseed can be up by 10 % compared to following a cereal. The quality of cereals is also improved (e.g. higher protein contents or lower mycotoxins contamination) when following pea and beans. Including peas or beans in crop rotation also lowers pest pressure by constituting a break in several pest cycles affecting cereals. Most legumes are very attractive to bees and often play the role of refuge for other wildlife, and can therefore have a positive effect on biodiversity in low-input agricultural systems. * Pérez Domínguez, I. et al (2016): An economic assessment of GHG mitigation policy options for EU agriculture (EcAMPA 2). JRC Science for Policy Report. Pulses are supplied by vessels in large cargoes. These vessels are only allowed to use fuel with low content of sulphur.This reduces the pollution per ton raw material transported, and also reduces the traffic on the roads implying other negative consequences like dust pollution, noise pollution and traffic accidents. Finished Vestkorn ingredients can be transported by both truck in vessels or by container freight, depending on customers wish.